The New Sensaphone SAT4D is designed to monitor a remote site no matter where it is located. Cellular coverage is getting better, but there are still many remote locations where cellular is not an option. The SAT4D uses direct satellite communications, which results in 100% coverage across the United States as well as many other countries. Not only does the SAT4D make your communication easy, but it also takes away your power source worries, too. The new SAT4D remote monitoring system requires no power at all. Mount it, connect your sensors, and walkaway. The SAT4D includes an internal battery that will operate for at least 5 years without power. Place it anywhere, and only come back every five years to change the battery. 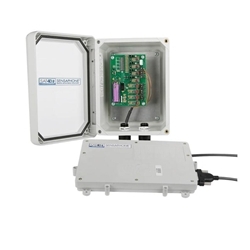 The Sensaphone SAT4D can monitor up to 4 dry contact inputs for alarms. Each input can be either normally open or normally closed. User programmable recognitions times can be set individually for each input. When an alarm occurs on any of the input, the SAT4D sends a message via satellite that is delivered to the Sensaphone SAT4D website. From there, up to eight custom voice phone calls are made to notify the appropriate personnel of the alarm. Up to six e-mail messages can also be sent for alarms. All communications to and from the SAT4D product go through the Sensaphone SAT4D server. You can log in to your account on the SAT4D website at any time to check the latest status, to check previous alarm events, or to make programming changes. In addition to sending out alarm events, the SAT4D will automatically send two status reports per day to the website. The history of these 12 hour snapshots remain available on the SAT4D server for future reference. Need to check the status and not near a computer with Internet access? No problem. With the Sensaphone SAT4D, you can just pick up your phone and call the server using a toll free number to listen to a voice status. In addition to the remote monitoring and alarm notification features, the SAT4D also includes GPS location technology. This allows the option to monitor mobile assets, or just the convenience of seeing exactly where all of your remote sites are located.